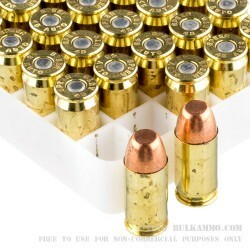 Speer has built their reputation by building ammo to meet the needs of law enforcement. 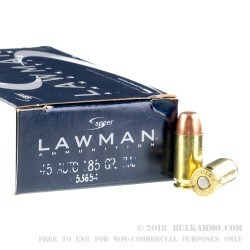 Vernon Speer was the first to mass-produce jacketed handgun bullets and started loading ammunition with them in the 1960’s for the Lawman line. 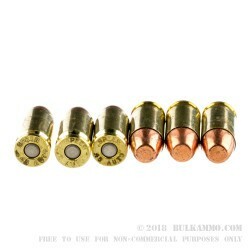 This .45 ACP round offers a flat-nose bullet that has a metal copper jacket fully encapsulating the lead core, boxer-primers, and full brass casings. This 185 grain bullet is ideal for target and training shooting, giving a clean and accurate pattern with its flat-nose punch. With a muzzle velocity of 1050, a non-corrosive CCI primer for fast ignition, and reloadable casings, this ammo will give you the same feel and point of aim as similar self-defense loads at a lower price. 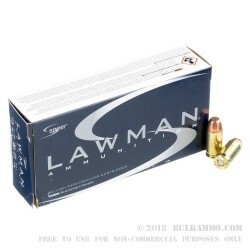 You won’t go wrong loading your 45s for training with this reliable, time-tested cartridge from this long-established Lewiston, Idaho based ammo manufacturer.